I was reading about Pedestrian Scrambles on Urban Photo the other day and the Memorial Boulevard/College Street/Westminster Street intersection immediately came to mind. 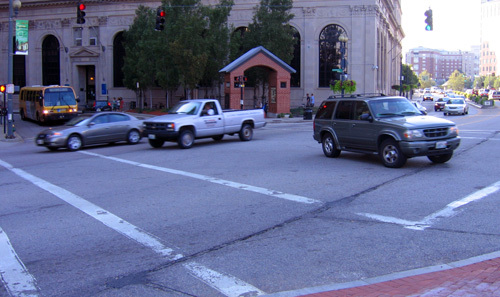 For those that don’t know, a Pedestrian Scramble is when all lights at an intersection turn red and pedestrians may cross both perpendicularly and diagonally across the intersection. At Memorial/Westminster/College we see an intersection with a large amount of turning traffic, especially off of College and Westminster, plus a large number of pedestrians, chiefly RISD students traveling from the dorm at 15West to classes on the far side of the river. There’s also a bus stop on one corner which is frequented by many RISD employees who need to diagonally cross to reach that stop. Combine this with poor site lines created by the ornate College Street Bridge and you have a recipe for disaster. The problem with the scramble is getting the pedestrians to obey the Don’t Walk phases. When the light on one street is red and the other one is green and you are normally allowed to cross the street, you will no longer be allowed to cross, only on the all red phase. Wouldn’t it be nice if Providence had a tenth that amount of pedestrian traffic? Ironically, the very pedestrian un-friendly city of Taunton has a heavily-utilized one of these at St Mary’s Square (Broadway and Washington St). These were typical in the old pre-timed signal systems but are included in a lot of new fully-actuated systems as well. 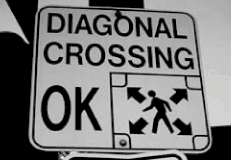 The problem is, there are no “diagonal crossing ok” signs at any of them, so nobody has any clue it’s okay.